HA NOI (VNS) — Viet Nam now ranks second among ASEAN's most favoured locations for US business expansion, based on a survey released in late August by the United States and American Chambers of Commerce in Singapore. Indonesia placed first and Myanmar placed third in the month-long survey, which polled 588 senior executives of US companies in all 10 ASEAN countries from May 5, to June 5, 2014. Brunei and Laos placed last in the survey, which included Cambodia, Malaysia, Myanmar, the Philippines, Singapore and Thailand. 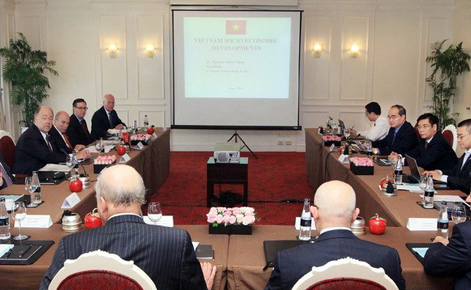 The survey listed Vietnamese strengths, including positive sentiments toward the US, the availability of low-cost labour and the level of personal security. But it also noted that the number of business executives who planned to diversify some of their investments or businesses from China into ASEAN over the next two years had dipped slightly from last year. This was most pronounced in Laos, where the number dropped significantly. On the other hand, Viet Nam had the highest number of respondents who planned to diversify their investments in the country, increasing by five per cent from that of last year. A majority or 51 per cent of respondents in the region think that the Trans-Pacific Partnership (TPP) will help their companies' regional trade and investment activities, with those stationed in Indonesia, Malaysia, Singapore and Viet Nam leading the way. According to the survey, about 95 per cent of expatriate employees in Viet Nam were generally satisfied with their assignments and 87 per cent attempted to extend their stay. However, respondents indicated that corruption was one of the biggest problems in Viet Nam, with 69 per cent of respondents indicating dissatisfaction. In general, about 74 per cent of the respondents reported that their company's level of trade and investment in ASEAN has increased over the past two years, and an overwhelming 89 per cent of respondents expected it to increase over the next five years. The profit outlook also appeared solid, with 63 per cent of executives expecting profit increases this year and 81 per cent, next year. "This survey underscored the confidence that US businesses have about ASEAN as it integrates economies, deepens its trade and investment relations with major trading partners and makes the region an important, attractive destination for US investment," said Tami Overby, the US Chamber of Commerce senior vice president for Asia. Judith Fergin, executive director of the American Chamber of Commerce in Singapore, said: "These positive findings point to positive outcomes for ASEAN – more jobs, more exports, more commerce and more rapid economic growth. US companies are happy to be contributing to this good news story." However, the survey also found substantial concerns and impediments to companies' growth in the region. As in previous years' surveys, corruption was the top issue across ASEAN and was cited by a majority of respondents in all countries except Brunei and Singapore. American companies also pointed to burdensome laws and regulations, poor quality infrastructure and the lack of transparency and the difficulty of moving products through customs in some countries as obstacles to greater investment. The survey also revealed that US companies took advantage of regional economic integration efforts, including ASEAN's free trade agreements (FTAs) with Australia and New Zealand, as well as China, India, Japan and South Korea. Nearly half or 49 per cent of respondents reported that they were using the FTA to export goods from ASEAN to China. American companies' use of other FTAs ranges between 43 to 47 per cent.